Whether in a boat on the sea or in a 4WD in the desert you have to work out your own route to follow. In both cases there are plenty of aids to guide your choice (maps/charts, land/coast-scape, tidal information, prevailing winds etc) but once you are out there you have to make your own decisions and it's useful to have electronic aids to provide your postion in relation to where you are heading. Recently the laptop used for navigation and tracking purposes on Temptress died and as we'd also got a bit fed up having to scroll around the tiny screen on our hand held GPS to review what was coming up, a big navigation aids overhaul has been taking place in the Harris household through the summer. A bigger screen, whilst remaining handholdable (if my camera is anything to go by sand and laptops won't mix). A compass screen clearly showing direction and distance to the next waypoint. Interchangable route finding between offroad/marine mode (ie straightline navigation between two points) and on the road navigation with turn by turn directions, sharing waypoints between modes. As we've already invested in both BlueCharts and Garmin streetmaps for the Middle East region, the choice of manufacturer was inevitable. It was just down to which model. 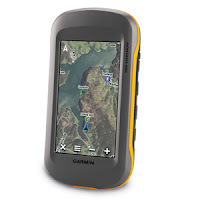 Garmin promote their GPSMap 620 with the strapline "navigate by land and sea". With both a marine and a road use mode and a huge 11.4 x 6.9cm screen menaing the device just about fits in the hand, it appeared to meet our requirements based on the specifications and reviews I read. Unfortunately the moment the SD card is swapped, it became perfectly clear that this gadget had a big pitfall. In reality it is two GPS's in a single body. To use seacharts it needs to be in marine mode which doesn't recognise the street maps and vice versa. Any waypoints entered are unique to the mode in use confirming the split personna. The lovely people at Marine Superstore were happy to give me a full refund and I headed back to my laptop for some more research. Since I'd done my original search back in early June Garmin had released in the UK the chunky, industrial looking Montana 600. The screen is slightly smaller than the GPSMap620 at around 9x5cm but that is still almost three times the area of our trusty GPS78s. Basically the buttons have been replaced by a big touch screen so you can choose to have menus or map on display and as the display can be in potrait or landscape it should be easy to see as far ahead as you need. Cotswold Outdoor at Hedge End had an offer including a complete set of UK Ordnance Survey maps. At last, only a month late, I had a birthday present from Kevin! The Montana's billed as a go anywhere product - street, water or offroad and Kevin happily played about swapping our various SD cards when I returned to Dubai with it but the acid test would always be actually using it . I took the Montana driving without a auto-cradle as there were none in stock (so no lovely-Emma voices to guide me) and it got me safely to my brother's home in rural Gloucester from Southsea and back via non-motorways, the Montana's beeps alerting me to an upcoimg turn. Back in Dubai we've been for an on-road drive around and about. Within the accuracy of the maps we failed to get lost even on the rapidly being reclaimed by the sand remains of the uncompleted Tiger Woods golf development (roads here tend to appear or disappear faster than the map-makers can keep up). Changing mode even within a route seems fairly easy and there are lots of gizmo features still to investigate like the barometric plotting. On Saturday we took our new best friend shopping to buy it a suitable carry case. An military-styled kharki camera case from National Geographical fitted the bill with the added bonus that the beltloop is sturdy enough to fit round the passenger hand hold on Jeanie Jeep's dashboard...who needs an auto-cradle? One small niggle still to iron out - on plugging in the USB 12v charger also purchased on saturday (the power input is different to our other Garmins) the Montana insists on saving all the waypoints and tracks then going into "PC connect mode". Guess I need to read the manual downloaded (there is only a quickstart guide in the box). A couple of trials left now - a drive in the desert and a sail off the coast of Dubai both of which need offroad or marine mode. Plus I need to download to it all our Geocache and desert driving waypoints from my laptop. In Part II I'll share the results of my review of chartplotting software and how we made the decision not to rock the boat!